Attorney General Jeff Sessions just received the final report for 2016 and one thing is clear. 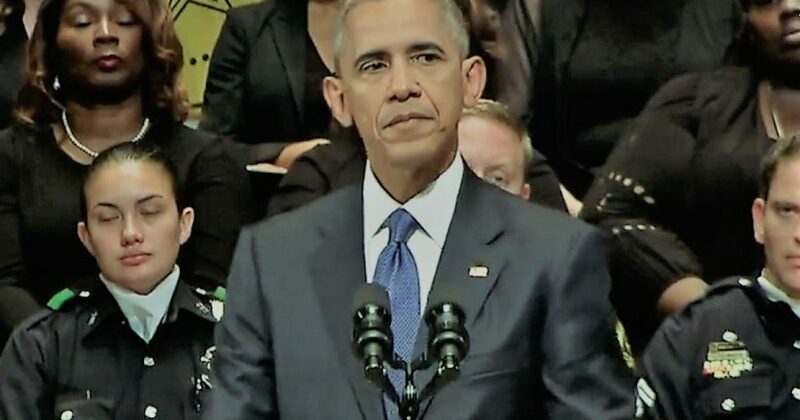 Obama’s war on police claimed more law enforcement lives than ever before. Monday, the FBI finalized their annual summary known as the “Law Enforcement Officers Killed and Assaulted Report.” As Sessions put it, the 61% increase in murders targeting law enforcement is both shocking and unacceptable. Of course, we knew Obama’s Administration painted police as the enemy. Now it’s indisputable. Breitbart breaks it down for us. The feloniously killed category is a narrow one. Sixty-two of those 66 officers died of gunshot wounds, with the last four dying after being hit by motor vehicles. The 66 officers feloniously killed in the line of duty in 2016 is the highest single-year figure since 1997. The single most common category of officer slaying and the largest increase recorded was the 17 “ambush” type premeditated killings in 2016, a 142 percent increase over the seven such attacks in 2015. Breitbart News has reported extensively on these attacks, the most egregious of which left five Dallas, Texas, policemen dead after a black nationalist opened fire at a July 2016 Black Lives Matter rally. An additional 52 officers died in accidents while on duty, for a total of 118 line-of-duty deaths, a 37 percent increase over 2015. The number of assaults on officers also increased significantly in 2016, with over 57,000 recorded nationwide. This figure represents a 14 percent increase over 2015 and a rate of more than 150 a day and nearly one assault for every ten police officers in the country. Sadly, Obama encouraged society to go to war with those who serve and protect. Obama spent 8 years stoking the flames of a racial divide, that for the most part had been relegated to the 60’s. Seeing the potential for Leftist profiteering, politically and financially, Obama encouraged hatred, particularly against law enforcement. Sessions doesn’t believe all hope is lost. In fact, the Attorney General puts total faith in our president. One of Trump’s first executive orders declared his intentions to “enhance the protection and safety of Federal, State, tribal, and local law enforcement officers, and thereby all Americans” In his first 10 months of office, he’s already made great progress. Official numbers won’t be ready until next year, but so far, police deaths have decreased by 20%. What a difference leadership makes. The mainstream media will see and even report this as bad news. Fewer police deaths signifies to the Left that the bad guys, cops are winning. The truth is, President Trump restores sanity to politics and safety to our streets. While Leftist mourn the loss of Obama, the rest of country sees the renewal of America. And that renewal includes the return of law and order.